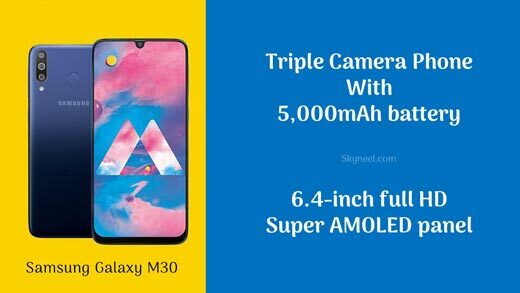 South Korean company Samsung has launched another Galaxy M series smartphone Samsung Galaxy M30. This year the company has introduced its Galaxy M series. The old phones of the series Samsung Galaxy M10 and Samsung Galaxy M20 also liked users too.Today we will give you the Samsung Galaxy M30 review of this series. Like this smartphone you can also call the ‘Value for Money’ smartphone. Samsung Galaxy M30 design is very attractive. You will love watching it Triple rear camera is provided in the back panel of Galaxy M30. We will talk further about the specifications of the camera. LED flash is also provided with triple rear camera. Fingerprint scanner is placed back side the phone. The front panel of the phone is Bezel Less and has a Waterdrop Notch feature. Bezels on the top of the phone are quite thin, while the bottom bezels are slightly thicker than those above the bezels. This kind of front panel is available in Nokia’s latest smartphone. The Power and Volume Control button has been given on the right side of the phone. While the left and the SIM slot have been given. The back panel of the phone is non-removable. In the panel below, you have been given mouthpiece along with speaker, USB type-C charging slot. Talk about the phone’s display, it has a 6.4 inch Super AMOLED Infinity-U display. In the display, you will not have any problem viewing 4K quality video. The color contrast of the display is quite good. If you make the brightness too full, it does not sting your eyes. The phone is much better to watch online or offline videos. Due to reduced bezel, you get the full view. The phone also supports Face Unlock. The display has a waterdrop, in which the selfie camera has been fitted. The earpiece has been fitted just above noutch. Samsung Galaxy M30 comes with dual 4G VoLTE SIM cards slot. There is a separate slot for the memory card. The phone is available in gradient Black and Gradient Blue Color Options. The weight of the phone will be slightly higher as it has a battery of 5,000mAh. Apart from this the phone’s grip is much better. Talking about the performance of Samsung Galaxy M30, the Exynos 7904 octa-qore processor has been given in it. The speed of the processor is given at 1.8 GHz and 1.6 GHz. Phone supports to 15 watts Superfast charging. In the phone you can easily play high-resolution games like PUBG. The phone’s processor does not allow the device to lag. The phone has a 5,000mAh power battery. The phone runs comfortably all day while charging it once. Connectivity features such as Bluetooth, WiFi in the Samsung Galaxy M30. The phone works on the Samsung Experience Version 9.5 operating system based on Android Orao 8.1. Speaking of the radiation of the phone, its SAR level is 0.409W / Kg, which is much less than fixed standard 1.6W / Kg. The phone comes with two memory variants 4GB RAM and 64GB storage and 6GB RAM and 128GB storage option. The device we have is a device with 6GB of RAM and 128GB of storage. You can extend its memory by up to 512 GB using memory card. Talking about the phone’s camera, it has a triple rear camera in its back. The primary camera is 13 megapixels, which has an aperture f / 1.9. Talking about the other two cameras of the phone, there is a 5-megapixels depth camera, which has an aperture f / 2.2. The device has a second 5-megapixel ultra-wide angle camera, which has aperture of f / 2.2. With the rear camera of the phone you can also click the good picture in Low Light. The selfie camera, it has a 16-megapixel front camera. The Artificial Intelligence feature is provided in the front camera of the phone. Live Focus and AR Stickers are also given in it. You can also click the photo of full HD quality with a selfie camera. The phone has been launched in India at an initial price of 14,990 rupees. If the price of the phone is seen, then this phone is heavy on other devices in this range. The direct competition of the phone will be from the mid-range smartphone of Chinese smartphone manufacturer companies like Xiaomi, Vivo, Oppo and Realme. We are calling the phone ‘Value for Money’ smartphones because the price of this device is kept according to Indian users. With Phone Being Affordable, you have many types of latest features and better camera quality. Only the weight of the phone can disturb you. Overall phones can be a better option for users of the Mid range. If you liked this article then you can also like our Facebook page and subscribe to our YouTube channel too. If you have any problem related to this article, you can comment and tell us.